The last days of the year in Vietnam, when the sky begin in the spring, when the wings flying over the sky, it is also the time when flowers are blooming. Tet in Vietnam, filled with flowers, especially in the Western South. Viet Ventures will take you explore the floating markets and flower villages in the western in Lunar New Year. The Mekong Delta currently has over twenty floating markets, including Phong Dien, Cai Rang (Can Tho), Tra On (Vinh Long), Con Tròn (Tien Giang), Cho Thom (Ben Tre) and Ca Mau. .. are the floating market known to many visitors. At one of these floating markets, you will feel the West's New Year. Visitors will be overwhelmed by the brilliant colors filled on the boat backward. A scenic full of yellow, red flowers will be an exciting experience for foreign visitors. 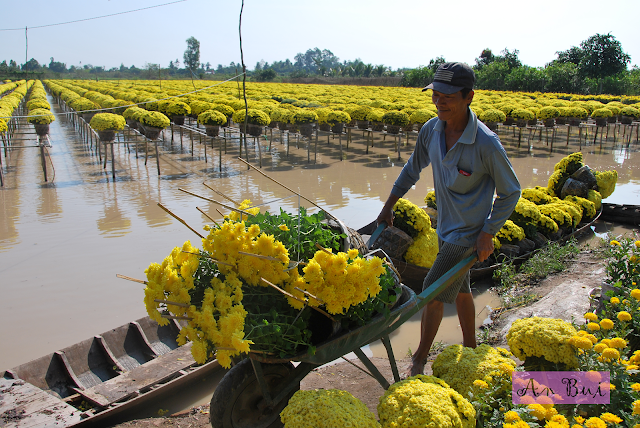 Unlike floating markets, Flower Village is the flower display center on the mainland. This is also an interesting place for visitors to visit and learn Tet. In the west, the most famous flower village is Sa Dec. When visitors come here, they will be witnessed how can farmers look after flowers. The flower pots are hung on the high rigs, under the invasive water. In the harvest season, artisans gardening will row boat skillfully flexible garden to water, prune, care for beautiful flowers. 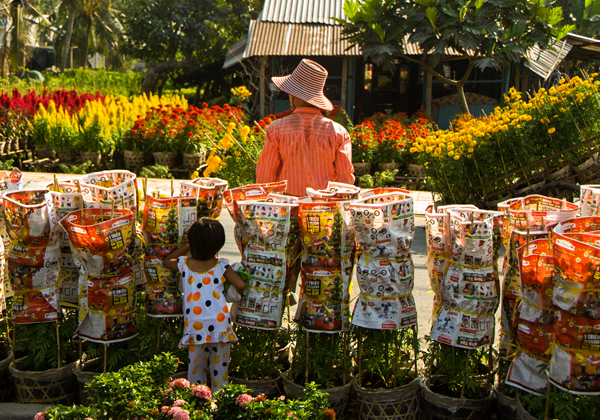 Come to Ben Tre, in addition to the famous fruit garden, also attracted by the Cho Lach flower village, with a lot of flower pots are carefully maintained. The most special feature is that these flower pots are well looked after by the artisans so that the flowers will bloom properly during the New Year's Day, which is extremely popular because the people like to display bouquets of flowers on 1st Lunar New Year because of good luck for the host. In addition, there is a flower village just over 70 km away from Ho Chi Minh City, which is My Phong Flower Village, Tien Giang. Besides displaying many kinds of flowers, there are other bonsai trees. The green leaves and yellow flowers, the more red they hang over the atmosphere to welcome New Year with family. About apricot trees, Phuoc Dinh, Vinh Long flower village is famous for so many years. They were bought from all the way to the west, then planted and tended in the garden. Especially the old apricot garden with solid roots, spreading branch branches, beautiful winding. This flower village is a place where many visitors come to buy for Tet holiday. 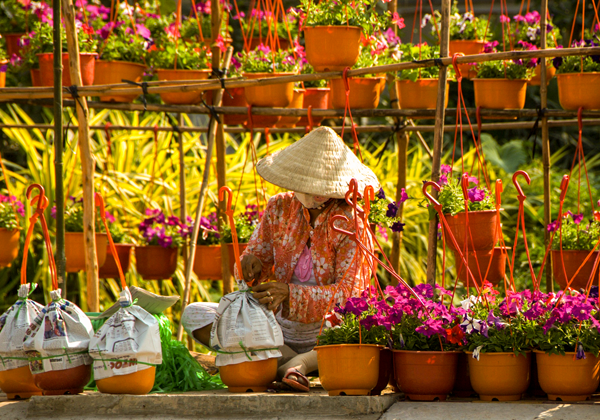 There is a flower village where traders always place flower pots along the Xang Xa No channel waiting for buyers, traders come to buy. The flower pots here are used by many traders and carried throughout the country. There is a canal full of Tet flowers as the signal of a happy spring, prosperous to every home.